Klarus is a new brand, but it has proven to offer high quality and durable LED flashlights. One of the best tactical flashlights from Klarus is the xt12gt flashlight. This flashlight is built from sturdy aerospace grade aluminum with a hard anodized finish. Also, it has a tempered glass lens with AR film plating for scratch resistance and to protect the Cree XHP35 HI D4 LED inside. Charging the flashlight isn’t a problem because it comes with a magnetic charging connector and USB cable for recharging the flashlight. It is a 1600 lumens flashlight and perfect for any type use. Read this Klarus xt12gt review to know more about this flashlight. Another feature that I love about this flashlight is that it comes with two programmable mode settings. These are the tactical and outdoor settings. Switch to the right settings in the right environment. In addition, it offers very bright light with a maximum of 1600 lumens that are enough to light the whole backyard or even a footpath. It covers a distance of up to 603 meters and uses one 18650 rechargeable battery or 2 3volt lithium batteries. These and many other features that we will look at below make this flashlight to be ideal for hunters, shooters, hikers, drivers, rescuers and many other outdoor enthusiasts. One of the first things that I look for in a quality flashlight is brightness. I love camping a lot and that’s why I need a quality and reliable light. But also, the flashlight should be well made and have the right features. Using the flashlight should as well be easy. With many brands on the market, it is crucial to select from the best. Klarus one of the popular flashlight brand on the market. So, in this klarus xt12gt review article we will find out pros & cons of this flashlight. If you need more powerful flashlight then klarus xt11gt or if you need less powerful flashlight then klarus xt11s will fulfill your requirements. Different light output levels with special lighting modes. 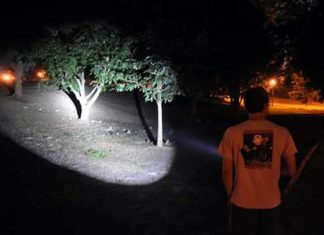 A flashlight is more useful if it offers several light options to the user. With such a feature, the user can have full control of how long the flashlight runs and so on. 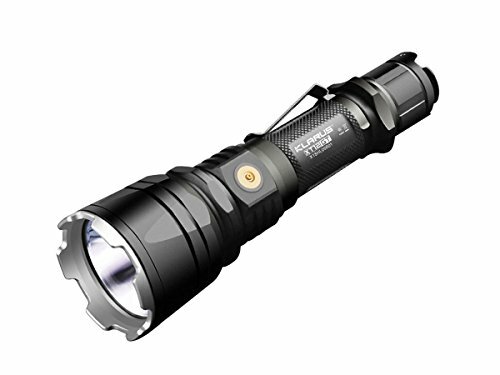 The Klarus xt12gt has 5 different light modes and special modes. These include low, medium, high, turbo, strobe, SOS, and keylight. Every light setting should be used appropriately so as to prolong battery life. High and turbo modes should be lit for some few minutes. The keylight is found on the magnetic charging connector. Durable aerospace aluminum alloy body. Just like many other quality flashlights, the Klarus xt12gt is a well constructed flashlight that can withstand different hardship. It is made of quality aerospace grade aluminum alloy and the finish is also great. It comes with toughened ultra-clear mineral glass lens with anti-corrosion AR coating. Very bright light. The Klarus xt12gt offers very bright light that can be used in different backgrounds. The flashlight has a maximum of 1600 lumens and is able to cover a distance of 603 meters. This is enough to cover a football pitch or light up a hill from the bottom to the peak. In my opinion, it is better than 3000 lumens g20 flashlight. For excellent lighting, you can switch the flashlight to turbo or high mode and you will get very bright light. The low mode operates on 10 lumens and it has an alternative of a keylight. The keylight can be used as a keychain light. ITS temperature control. This feature makes it possible to monitor and adjust the internal temperature of the flashlight. When the flashlight is used for a very long period of time on the turbo, strobe or high mode, it tends to get hot. Klarus has included this feature to prevent the heating of the device as it can damage the flashlight. Reverse polarity protection. This feature protects the flashlight from being damaged when the batteries are placed in the wrong way. When in hurry or not paying attention, you can place the batteries in the wrong way and they might end up damaging the flashlight. So, this feature protects this from happening. Also, the heat dissipating fins prevent the light from overheating. Easy to store with the lanyard and holster. After using the flashlight or when setting up your camp, you can attach the flashlight on your belt, pocket or backpack. This is done with the assistance of the lanyard, pocket clip, and holster that it comes with. Also, it is compact and lightweight, thus it won’t be a burden to store as you go about with your activities. The battery capacity indicator light indicates the remaining charge. Green light means the flashlight is over 70%, Orange indicator means it is between 30% and 70%, Red indicator shows it is less than 30%, and finally, red and flash indicator means that it is below 10% or below. Easy to use with the patented dual button tail switch. One of the features that I have fallen in love with is the dual button tail switch. This settings enables you choose a light that suits your background. These are the outdoor and tactical settings. In the tactical setting, the user can access the turbo, high, and low modes. Also, one can access the strobe mode temporary. For the outdoor setting, one can access turbo, high, medium, low, and SOS modes. One can as well access to low mode. Additional accessories. Even though there are many flashlights on the market, it is vital to have one that offers you several features. Klarus xt12gt LED flashlight comes with a spare o-ring, magnetic charging connector, holster, and lanyard. But you can also buy other compatible accessories like gun mount and wand. This flashlight is a bit complex and not easy to use. This is because of the various features that it comes with. The charging system is not very efficient as it stops working after sometime. It needs to be handled with care. I’ve come to love this flashlight as it functions exceptional. It has great features that make it to be versatile and outperform other lights on the market. The Klarus xt12gt is sturdily built from aerospace grade aluminum body. It has the ability to resist impact and can be immersed in water up to 2 meters for 30 minutes. With a maximum of 1600 lumens, this brightness is outstanding and can light a pitch or a very large area. It is as well compatible with Klarus traffic wand and 1 inch rail mounting systems. So, you can use the Klarus xt12gt flashlight in your shooting practice or in emergency situations. 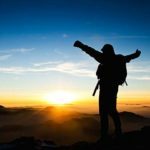 I guess, you have gotten a clear idea after reading this Klarus xt12gt review.